Once upon a time there stood a nine-story building — ten stories including its attic — at the southeast corner of Eighth and Locust streets in the heart of downtown St. Louis. This grand building was named the Columbia Building, a name apt for a building completed in 1892, 400 years after Christopher Columbus arrived in North America. The builders commissioned prominent Saint Louis architect Isaac Taylor, who had recently designed the great Romanesque Merchandise Mart (then Liggett Building) at 1000 Washington, which opened in 1888. Taylor handled the design for the Columbia Building deftly, filling the small but prominent lot — located directly across the street from the Old Post Office — with a tall, narrow steel-framed office building that utilized the principles of the emergent Chicago School of design with a restrained Romanesque formality. 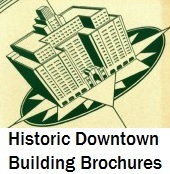 The building was a small masterpiece of downtown design, and remained so for many years. Then, abruptly, the Columbia Building’s world fell apart. Its first damage came from the 1971 demolition of the Victoria Building diagonally across the intersection. The Victoria Building was what model railroaders would call a “kit-bashed” building: a mix of some parts of Louis Sullivan’s St. Nicholas Hotel at that site, which had suffered a bad fire in 1905, and some new construction below. The St. Nicholas Hotel, completed in 1893, had been dazzling in its eclectic application of Sullivan’s principles to a pitched-roof hotel building. Its later incarnation was slightly dull, flat-roofed but certainly not ugly. The remains of Sullivan’s design were strong enough to suggest latent grandeur, and that grandeur heightened the dramatic qualities in the other buildings at the intersection, including the Columbia. Yet, after the demolition of the Victoria Building, the owners of the Columbia were not content to let their building take on the task of holding together the integrity of this part of the Old Post Office district. They proposed a ghastly destruction of the building that continues to puzzle observers of Saint Louis architecture: they wanted to remove the building’s top eight floors (including the attic), leaving a two-story storefront box at the corner. After receiving city approval, the owners went forward with their plans in 1977 and left behind a bizarre little Columbia Building that still stands today. One could find some poetic justice in the diminution of a building named for the Italian invader Columbus. Certainly, his legacy is unworthy of a whole fine Isaac Taylor building. Had this been a bold anti-imperialist gesture coming in 1977, it would have seemed gloriously prescient, ahead of the historical scholarship of the 1980’s and 1990’s that has punctured the heroism of Columbus. Yet the lopping of the Columbia building was not an act of anti-imperial sentiment, but a calculated move on the part of capitalists trying to squeeze greater profit from their piece of a decaying imperial city. Saint Louis was in decline, and the real-estaters could no longer afford to venerate their own monuments. The Columbia Building owners, however, managed to do something few other downtown building owners did. Perhaps this is due to the irrationality of their act; other owners tore down “unprofitable” buildings for supposedly-profitable parking lots and garages. No one else assumed that the way to make money on the old buildings of downtown was to remove the unprofitable portions while saving the rest. The Columbia Building as it appeared on November 26, 2004. The dentils on the new cornice are painted on. In the early 1990’s, developer Larry Deutsch attempted to utilize the Columbia Building owners’ strategy, and proposed to remove the top two floors of — coincidentally — Taylor’s Merchandise Mart. The city’s Heritage and Urban Design Commission voted down Deutsch’s plans, perhaps anticipating the current downtown housing boom. Nowadays one can see the wasted fortunes of the short-sighted custodians of Isaac Taylor’s buildings: another developer has profitably renovated the entire Merchandise Mart for housing, while the owners of the Columbia Building have no upper floors to enter into the condominium speculation. I will suggest that the Columbia Building, with its small floor areas and corner location, would have been one of the easiest downtown buildings to adapt to housing. Instead, it is a strange relic, with its first floor retail space currently vacant. Ah, what a New World we always seem to live in! Very good post. I never knew about this until now and it is very sad. I pass it at least once a week and always wondered how that small corner building got there with everything else around it. Correct me if I’m wrong, but I believe the jeweler is gone from the 1st floor space now. You are right. I have made a correction. That’s a real shame. Isaac Taylor rocks! Check this out . .
Looks like the structure to the east used to be taller as well, though its replacement is a lovely building. I assume the Columbia Building has the original foundations remaining so that replacement of the upper floors would be possible someday? A fascinating story. I would never have guessed this unassuming structure I walk past quite often would have such a crazy history. Seriously, if downtown is able to add infill on vacant lots in the coming years, perhaps it would be economically feasible to add floors back to the building. Good tid bit of info…love this building. Look at the glass half full. Ahhhhhh, what precious memories. Larry Deutsch is a crook. He towed my car (and three others) on a Saturday while eating breakfast at 11th & Locust, because I was in his private lot, which was basically empty, other than a few other patrons of the restaurant. The lot is not gated and not well marked as being private. He was there at the time in the lot calling up the tow trucks. It was 30 degrees outside and he told me and my pregnant wife to “deal with it.” I follow the rules and would be willing to park elsewhere and/or pay for parking. He either enjoys screwing people, or gets kickbacks from the city for towing fees, or both. The demolition of the upper floors of the Columbia Building was carried out on behalf of Charles Cella, the owner of several important downtown properties at the time, and the owner of racetracks in Arkansas and Illinois and strip centers in Ladue. The rationale, as I recall, was to reduce taxes on the property. The worst part of the story, in my estimation, is not that he proposed the demolition, but that he was permitted to do it.